WHAT: HARBOR WRECKS WHERE: TANTURA LAGOON, ISRAEL | EXCAVATION: 1994 | DATE OF WRECK: A.D. 4TH-18TH C.
Tantura Lagoon is one of the few natural harbors along Israel’s long and straight Mediterranean coast. The cove has served as a port facility for Tel Dor, one of the largest ancient mounds in Israel for at least 4,000 years. Due to the cove’s geographic configuration, ships that wrecked here tended to be buried and preserved under a thick anaerobic blanket of sand. These considerations – of antiquity and geography – make the cove an exceptional laboratory for the study of historically and archaeologically significant shipwrecks. In 1994, a long-term project of exploration began carried out jointly by INA at Texas A&M University and Haifa University’s Center for Maritime Studies (CMS). In 1995, they completed field work on a hull – subsequently named Tantura A . The portion examined constitutes about twenty-five percent of the bottom of a late Byzantine small local coaster, that originally was probably about 12 meters long. The hull had been constructed without the aid of unpegged mortise-and-tenon joinery that, until this discovery, had been considered standard for that time. This makes Tantura A the oldest recorded shipwreck in Mediterranean waters to have been built in the innovative methods that would evolve more fully and become standardized during medieval times. During the course of the 1995 season, a hydraulic probe survey was completed in the immediate area surrounding Tantura A, in search of additional portions of it. While none were found, remains of four other shipwrecks were located. 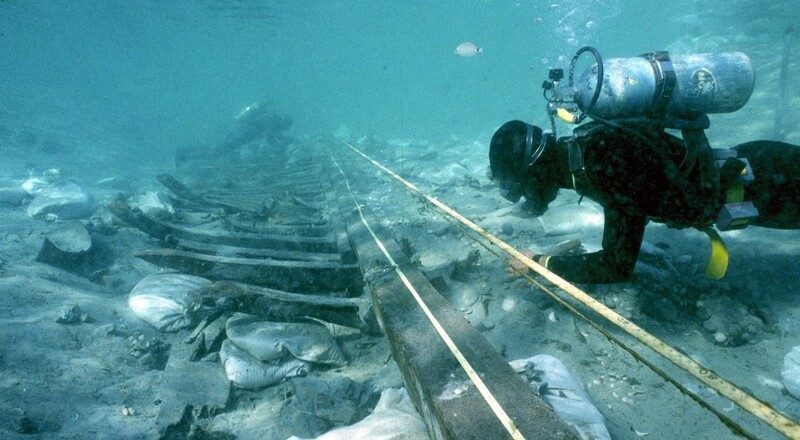 In 1996, the project returned to an early 5th-century A.D. shipwreck. This hull is remarkable for dating to a century from which there are no other documented Mediterranean shipwrecks, as well as for having a previously unrecorded long and narrow hull shape. Bryant, V.M., 1995. Preliminary Pollen Analysis of Sediments Collected from Tantura Lagoon. INA Quarterly 22/2:18-19. Carmi, Y. and D. Segal, 1995. How Old is the Shipwreck from Tantura Lagoon? The Radiocarbon Evidence. INA Quarterly 22/2:12. Charlton, W.H., 1995. The Rope. INA Quarterly 22/2:17. Dahl, G., 1915. The Materials for the History of Dor. New Haven. ITF= In the Field. National Geographic Magazine 191 (January 1997):103-109. Kahanov, Y. and S. Breitstein, 1995A. A Preliminary Study of the Hull Remains. INA Quarterly 22/2: 9-13. Kahanov, Y. and S. Breitstein, 1995B. Tantura Excavation 1994: A Preliminary Report on the Wood. C.M.S. News 22 (August). Kahanov, Y. and J.G. Royal, 1996. The 1995 INA/CMS Tantura A Byzantine Shipwreck Excavation – Hull construction Report. C.M.S. News 23 (December): 21-23. Sibella, P., 1995A. The Ceramics. INA Quarterly 22/2: 13-16. Sibella, P., 1995B. Notes on the Architectural Marble. INA Quarterly 22/2: 19-20. Sibella, P., 1997. Light from the Past: The 1996 Tantura Roman Lamp. INA Quarterly 24/4:16-18. Steffy, J.R., 1994. Wooden Ship Building and the Interpretation of Shipwrecks. College Station. Stern, E., 1993. The Many Masters of Dor. Biblical Archaeology Review 19/1: 22-31, 76,78; 19/2: 18-29; 19/3: 38-49. Stern, E., 1994. Dor: Ruler of the Seas. Jerusalem. Wachsmann, S., 1995B. The 1994 INA/CMS Joint Expedition to Tantura Lagoon. INA Quarterly 22/2: 3-8. Wachsmann, S., 1995C. Return to Tantura Lagoon. C.M.S. News 22 (August). Wachsmann, S., 1996A. A Cove of Many Shipwrecks: The 1995 INA/CMS Joint Expedition to Tantura Lagoon. C.M.S. News 23 (December) cover, 17-21. Wachsmann, S., 1996B. 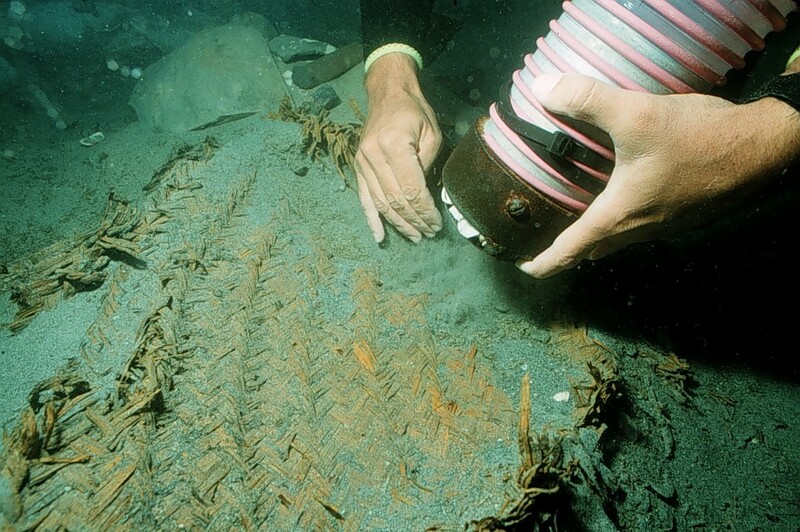 Technology Before its Time: A Byzantine Shipwreck from Tantura Lagoon. The Explorers Journal 74/ 1: 19-23. Wachsmann, S., and Y. Kahanov, 1997. Shipwreck Fall: The INA/CMS Joint Expedition to Tantura Lagoon, Israel. INA Quarterly 24/1: cover, 3-18. Wachsmann, S., Y. Kahanov, and J. Hall, 1997. The Tantura B Shipwreck: The 1996 INA/CMS Joint Expedition to Tantura Lagoon. INA Quarterly 24/4: cover, 3-15. Wachsmann, S., and K. Raveh, 1984. A Concise Nautical History of Dor/ Tantura. International Journal of Nautical Archaeology 13: 223-241. ABOVE: An archaeologist uses a dredge to uncover some woven matting (Photo: INA, Slide #M-179).